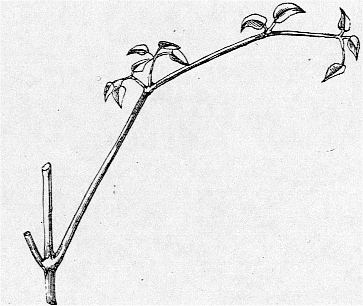 In the autumn of 1864 I finished a long paper on Climbing Plants, and sent it to the Linnean Society. The writing of this paper cost me four months: but I was so unwell when I received the proof-sheets that I was forced to leave them very badly and often obscurely expressed. The paper was little noticed, but when in 1875 it was corrected and published as a separate book it sold well. I was led to take up this subject by reading a short paper by Asa Gray, published in 1858, on the movements of the tendrils of a Cucurbitacean plant. He sent me seeds, and on raising some plants I was so much fascinated and perplexed by the revolving movements of the tendrils and stems, which movements are really very simple, though appearing at first very complex, that I procured various other kinds of Climbing Plants, and studied the whole subject. I was all the more attracted to it, from not being at all satisfied with the explanation which Henslow gave us in his Lectures, about Twining plants, namely, that they had a natural tendency to grow up in a spire. This explanation proved quite erroneous. Some of the adaptations displayed by climbing plants are as beautiful as those by Orchids for ensuring cross-fertilisation. A detailed description of the three forms in which the first edition of this work are found is given in the Journal of the Society for the Bibliography of natural History, Vol. VI, p. ; they are summarized here in Nos. 833-835. All three are from the same setting of type, but the first makes up most of a double number of the Journal and Proceedings of the Linnean Society. Copies of it are found with the remaining pages (119-128) discarded, but it can always be recognized by the extraneous matter on page 118 and by the absence of a separate title leaf for Darwin's paper. The wrappers, if preserved, are green. The other two are offprints, one commercial and one for the author. Both have tipped in title leaves, both are in buff wrappers, and in both the title, and the author and his honours, are the same. They differ in the note on the source of the original, in the imprint, and in one having the front wrapper printed from the same setting of type as the title page and the other having it plain. In the first the note reads [From the JOURNAL OF THE LINNEAN SOCIETY. ]; the imprint is the same as that of the part, except that it has been reset and there is no comma after Roberts. In the other the note reads [Being Nos. 33 & 34 of the 9th Volume of the JOURNAL OF THE LINNEAN SOCIETY, Section Botany.]. The imprint is LONDON:/PRINTED BY TAYLOR AND FRANCIS,/ RED LION COURT, FLEET STREET./1865. The part of the Journal and the commercial offprint give no indication that Taylor and Francis were the printers. The offprint was listed in the English Catalogue, Vol. II, under the name of Longmans, at a price of 4s. Copies that I have seen in libraries and in commerce have almost invariably been of the commercial form, and the facsimile (1969) is the same. A copy of the true author's offprint was sold at Sotheby's in 1972 it was inscribed 'From the Author' in Darwin's own hand, and had 'W. B. Tegetmeier 1865' on the plain front wrapper in the latter's hand. Tegetmeier (1816-1912), an expert on fancy birds, was an old friend and correspondent. The second edition is usually described as the first edition in book form, which is a doubtful statement because the first edition was available commercially, as shown above, and, being of 118 pages, can hardly be considered as a pamphlet. It was however the first edition in hard covers and appeared, much enlarged, with Murray's imprint, in an arches style case, in 1875. According to Life and letters, it was published in September, but Murray's list of printings in later issues gives November. There were 1,500 copies, and there was a reprint of a further 500 in September 1876, probably the smallest issue of any Murray Darwin. The third thousand of 1882 has an appendix to the preface, dated that year, and a five line note of errata on the verso of the last leaf of the contents. These refer to author's errors, rather than to literals and they remain un-corrected through subsequent reprintings from stereos: this edition is therefore the final text. The reissue of 1888, also third thousand, is the first in a standard binding, but the fourth thousand of the same year and the fifth of 1891 revert to the arches style. It was reprinted as late as 1937, the last of all Murray Darwins, and in this form remained in print until 1965. The first edition did not appear in America, nor was it translated in Darwin's lifetime, but has a recent facsimile. The second appeared in French, German and Italian and in America from English stereos.